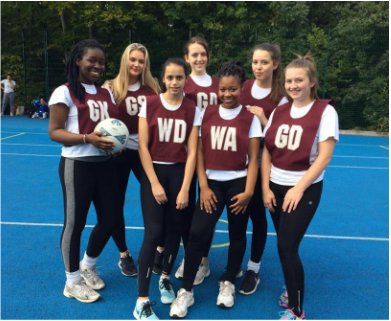 ​On Wednesday 12th October the Upper school netball team participated in the Waltham Forest Rally at Forest School. After many training sessions the team were eager to get the netball season off to a good start. Seeing as Highams Park dropped out, we had two scheduled matches against Heathcote and Forest. We started off by playing forest, which we all knew would be a challenging 14 minute game, but we went in with a positive attitude knowing we will all go out and fight for a win. However as presumed, we were already behind 9-3 before half time, nevertheless that didn’t cause our heads to drop. After a quick team- talk at half time we headed back on court with hope of pulling it back, yet Forest managed to get in another 9 goals making it 18-3, which I must admit was quite disheartening, but we all worked incredibly hard and still kept our heads up as we still had another game to go. Up next was Heathcote; this game was all about numbers as we beat them 13-0! With minimal mistakes and determination to make it a good win, after a not so good game before, we really turned it around. There was a great atmosphere on court during this game, which made it so enjoyable! Our training sessions clearly paid off as we made so many interceptions, turnovers, and of course…goals! We made it through to the second round that leads on from this rally, which as a team we are very proud and pleased about. From never playing together, to becoming one of the top sixth form netball teams in Waltham Forest I feel is something we as a team should be incredibly proud of! Well done to our shooters, Olivia Sach (GS) and Emily Smith (GA), our center court players Cerys Boyle (C), Aliyah Meade (WA) and Anisah Nijibat (WD), and our defender and captain Hamidah Hadesanya (GK).